So much for that short-term channel! I should’ve been way more patient with this one instead of hopping right in. Here’s a quick review of my GBP/AUD forex trade. 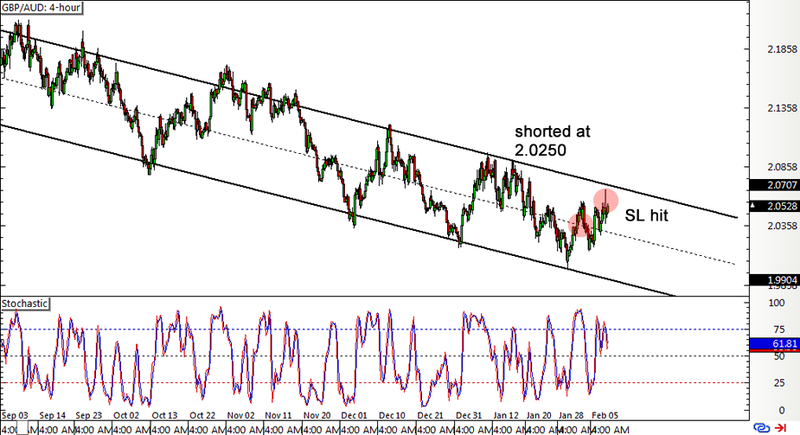 Before reading on, make sure you check out my initial GBP/AUD short idea right here. I had my one eye locked on that descending channel on the 1-hour time frame that I failed to see this long-term channel visible on the 4-hour chart. Had I seen this, I probably would’ve set my stop much wider or waited for an actual test of the resistance near 2.0700. Instead, I shorted at market (2.0250) right after the RBA decided to keep interest rates on hold and just before the BOE Super Thursday. Those U.K. events did turn out bearish for the pound, as MPC members voted unanimously to keep rates unchanged this time and the Inflation Report contained another round of downgrades for growth and inflation estimates. Check out the longer-term time frames for other potential resistance zones and better entry levels! Set a wider stop based on the larger descending channel. Wait for a bit more bearish momentum during the BOE Super Thursday. Close early since I was taking a short-term setup or cut losses when sentiment shifted against the comdolls. I guess I’ll just chalk this up to experience then! For now, I’ve got a 300-pip dent or a 0.50% loss on my account that I’m hoping to make up for with my EUR/JPY short position that’s looking good so far.